Stephen Howze Author: Sharon G. Flake Publisher: Hyperion Year of publication: 2000. 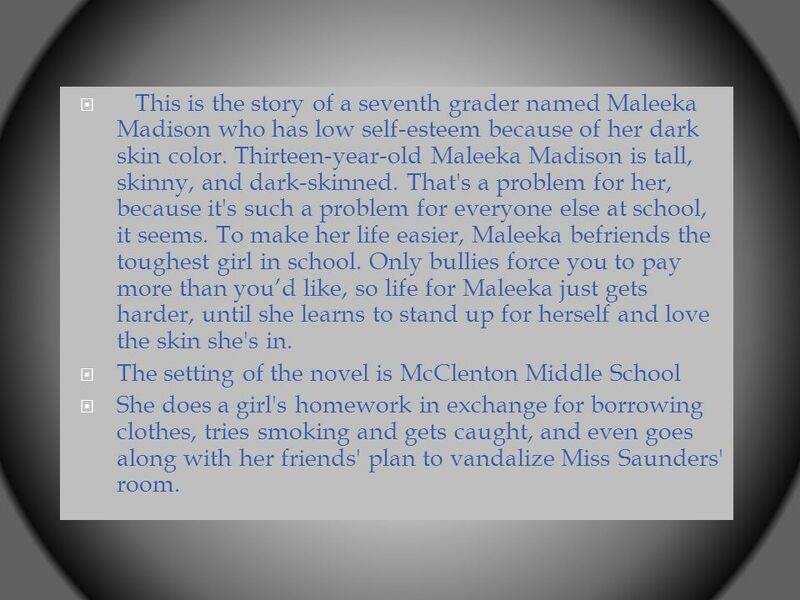 2  This is the story of a seventh grader named Maleeka Madison who has low self-esteem because of her dark skin color. Thirteen-year-old Maleeka Madison is tall, skinny, and dark-skinned. That's a problem for her, because it's such a problem for everyone else at school, it seems. To make her life easier, Maleeka befriends the toughest girl in school. Only bullies force you to pay more than you’d like, so life for Maleeka just gets harder, until she learns to stand up for herself and love the skin she's in.  The setting of the novel is McClenton Middle School  She does a girl's homework in exchange for borrowing clothes, tries smoking and gets caught, and even goes along with her friends' plan to vandalize Miss Saunders' room. 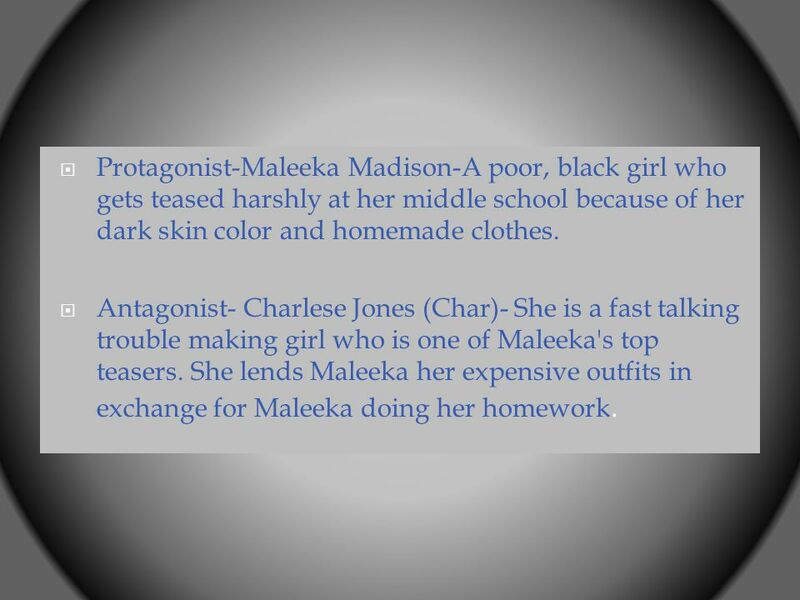 3  Protagonist-Maleeka Madison-A poor, black girl who gets teased harshly at her middle school because of her dark skin color and homemade clothes.  Antagonist- Charlese Jones (Char)- She is a fast talking trouble making girl who is one of Maleeka's top teasers. She lends Maleeka her expensive outfits in exchange for Maleeka doing her homework. 5  The twins (Raina and Raise)- Char's "sidekicks" in a way. They agree with everything and go along with everything Char does  John-John- Another one of the people at Maleeka's school who teases her. He made a rap about how dark she was on a class trip. He later reveals to Maleeka that the reason he teases her so much is because when Maleeka first moved to their neighborhood in second grade she didn't want to sit by him, therefore, he assumed she thought she was better than him. 7  I like this book it is easy to read and it is easy to relate to. 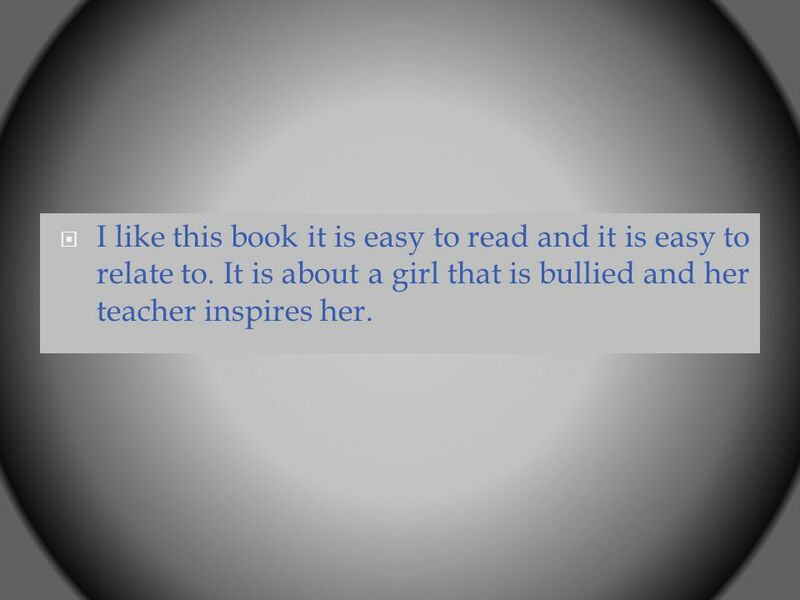 It is about a girl that is bullied and her teacher inspires her. 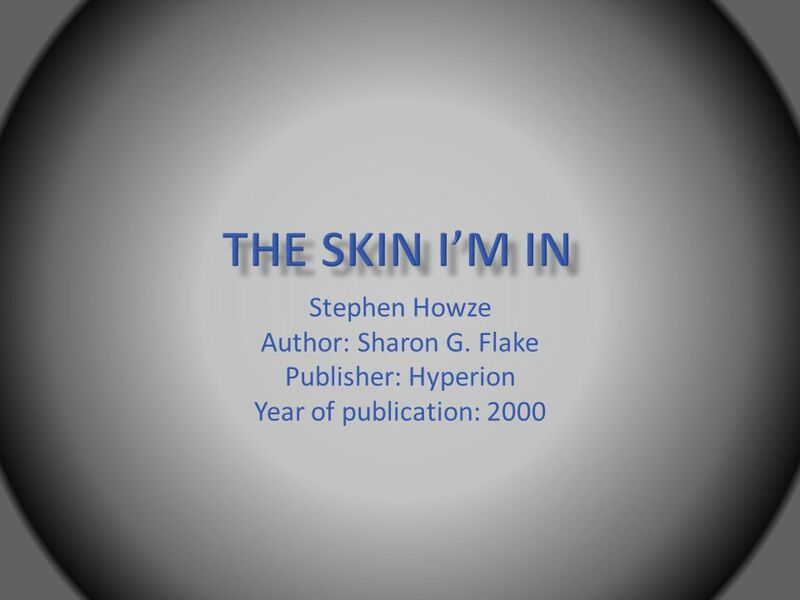 Download ppt "Stephen Howze Author: Sharon G. Flake Publisher: Hyperion Year of publication: 2000." This story takes place in the Projects. The characters lived in a so- called Janky House Raspberry Hill is tired of not having money. Name: Tori Lerma Period: 3 rd. Setting This story takes place at Rainas middle school, her house and the dentist office at noon. 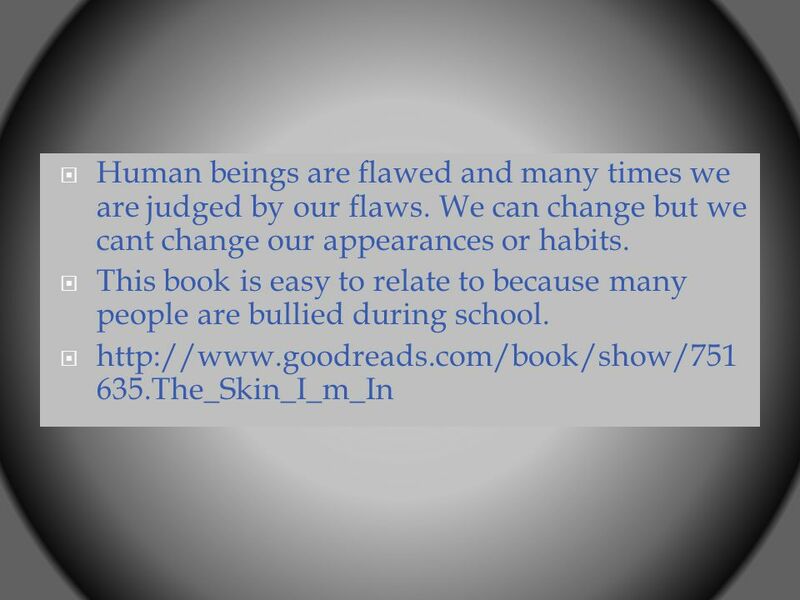 Book By: Katherine Hannigan Power Point By: Caroline G.
The Skin I'm In Author: Sharon G Flake Year published: 2000 Type of book: Realistic Fiction. Junie B., First Grader (at last) By: Barbara Park AR Book Level: 2.6 AR Book Points 1.0 Pages 76 Summary: Junie B. doesn’t like first grade. She has many. NOEMI ROBLERO PD: 5 One character in my book is Zoe Monday Costello nicknamed “ the Zoe Lama”. She is a problem solver and everyone in school takes her. Hooway for Wodney Rat! Story Map Story Title: Hooway for Rodney Rat! Published By: Harper Teen Produced By: Alloy Entertainment Unbelievable is the forth out of eight books Pretty Little Liars Novel is a National Bestselling. Madi Dunigan Published: DATE Owen and his few friends are usually at school. He couldn't be anywhere else because of the characters in the book. Creating Interesting Characters Some people think that an exciting plot is all it takes to make a story good, but in order to have an exciting plot, you. The story takes place in a very small town. In a very old house with an attic under the roof and a cellar under the ground and an overgrown garden with. Facilitators: The Encore Team.  Today we will address: Manners How should you look?